Didrex is a prescription diet drug in a brand name form, which is intended for use by certain obese individuals who must lower their body fat levels in order to improve their health and lower their risk of various medical conditions. The generic form of this pill is called benzphetamine. This pill is an appetite suppressant that is available only when prescribed by a licensed doctor. It functions by stimulating the central nervous system so that the heart rate and blood pressure will rise. The outcome is often a decline in the individual’s hunger. The use of Didrex is prescribed along with a healthy weight loss diet. This is because swallowing the pill won’t actually cause fat to be burned away. On its own, it does not have any direct impact on the body’s fat levels. Instead, its use is meant to help a dieter to be able to adopt the habits that are necessary to naturally lose the excess weight. These include reducing the number of calories that are eaten every day, and increasing the daily activity level through exercise that is appropriate to the fitness level of the dieter at the time. Therefore, in order to lose weight with the use of Didrex, the dieter still needs to be willing to dedicate him or herself to making the same efforts that would be required without the drug, in order to reduce his or her body mass index (BMI). These efforts are made easier because the user of this medication will not suffer from the same level of hunger that he or she would without the assistance of the drug. It also provides many users with a boost in energy levels, which can make it easier to continue to exercise, despite the reduction in energy that would be produced by calories. The use of Didrex is meant to be only short term – enough time for the dieter to be able to establish all of the necessary habits in his or her life. The reason is that it gradually decreases in effectiveness over time. Taking a larger dose does not help in overcoming this issue because it does not promote more benefits, but it does increase the risk of strong or dangerous side effects, and especially addiction and withdrawal symptoms. Therefore, dieters using Didrex should take a doctor’s instructions very seriously and follow them as closely as possible to ensure the greatest benefit but with the lowest possibility of severe side effects and withdrawal discomforts. 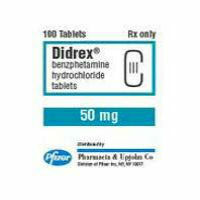 This entry was posted in Prescription Diet Pills Reviews and tagged appetite suppressant, benzphetamine, prescription weight loss on February 21, 2014 by Diet-Pills.cc.